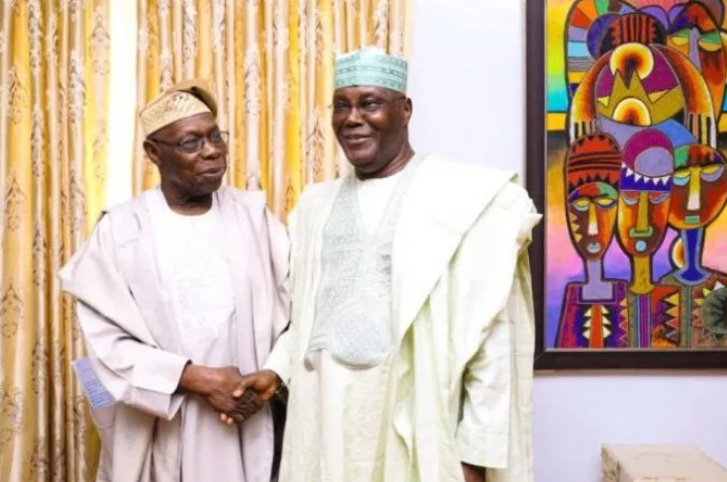 The presidential candidate of the Peoples Democratic Party (PDP) in the just-concluded presidential election, Atiku Abubakar has met with former President Olusegun Obasanjo in Abeokuta, Ogun State. Although details of the meeting, which took place on Thursday, were not disclosed, it was gathered that it might not be unconnected with the resolve by the PDP flag bearer to drag President Muhamadu Buhari and the All Progressives Congress (APC) to court over the outcome of the presidential election. It was learnt that the former VP had a private discussion with Obasanjo which lasted for over an hour. Atiku was said to have also had lunch with his host, after which he departed the residence to observe the Muslim prayers at the mosque, Channels Tv reports. The media aide to the former president, Kehinde Akinyemi, confirmed Atiku’s visit to his principal.